Justin Conceicao from global design firm, Unispace. The trend for modern workspaces is on the increase. What is the impetus for this change? I think the change has happened quite organically as working styles, organisational culture, and people’s expectations, have evolved. The ever increasing speed of communication has had a major impact on us as individuals and this naturally spills into our working lives, influencing the way spaces are designed to take advantage of technological advances. Essentially the idea of ‘one size fits all’ is no longer viable. Workplaces need to adapt and grow to reflect how people work today but more importantly, how they will work in the future. What can ‘considered’ design do for a workplace? Everything! I think an important factor for any business to consider when updating their workplace, is that the design should never just be about looking good. A superficial change will not help a company to achieve their strategic objectives over the long-term. It’s about understanding their goals as a business and how space, technology and culture can support those goals. Taking the time upfront to engage with the business and set project objectives ensures that multiple scenarios are considered in order to develop a tailored workplace solution. The design and delivery phases then turn this solution into reality and we continue to measure the performance of the new work environment after the client occupies the space. 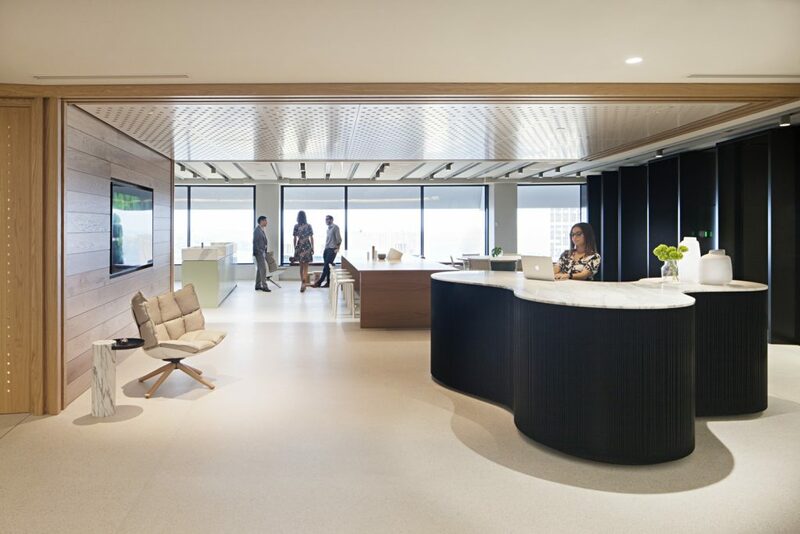 A new workplace can act as the catalyst for wider change across the business and providers of workplace need to understand that their job isn’t done when staff move in. Why did Unispace decide to relocate their global Head Office to Grosvenor Place? It was an easy decision for us. Grosvenor Place has an unrivalled, timeless quality about it that was hard to match when we were searching for the right fit. It also happens to be designed by one of the most innovative and pioneering architects of the 21st century, Harry Seidler. His modernist methodology matches our company philosophy. We are on the 43rd floor, with panoramic views of Sydney Harbour. The space at Grosvenor Place was the perfect blank canvas of clean geometrical lines and curves for us to make our own. The building’s location, paired with its premium reputation serves all our needs and our new workplace is designed to evolve with us as our needs change over time. Talk us through Unispace’s design. The design was very much developed around our business objectives and we took our team through the same strategy process we offer to our clients. We needed a highly flexible space that could accommodate our growing staff numbers, support our high levels of project-based work and promote collaboration and innovation. We also wanted to use our new headquarters as a platform to showcase our work to potential clients – a living case study. We occupy the entire northern side of the 43rd floor and our design takes advantage of the curves which make up the building’s elliptical floorplate. Designing the space to take advantage of the amazing views and great natural light was a key consideration for us. 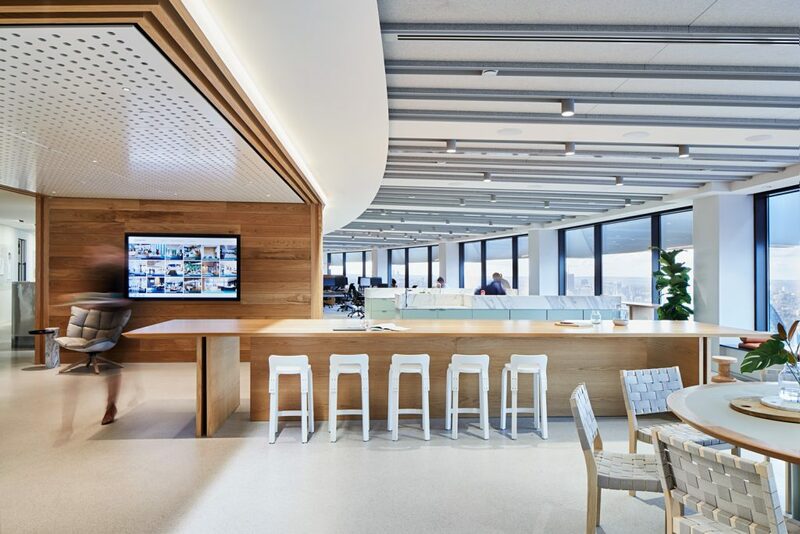 As a result of the findings from the strategy phase, our Sydney studio adopts an agile working environment whereby no one has an assigned seat. This includes a variety of work settings to support individual, high focus and collaborative work with technology that enables seamless movement between different work modes. Health and wellbeing is also an important factor for Unispace. 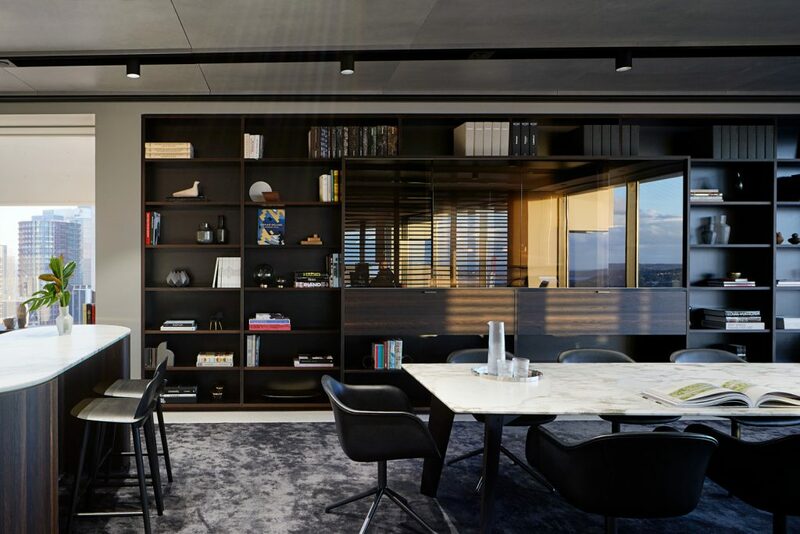 One of the most spectacular features of our new office is the panoramic views over Sydney Harbour which follow the entire length of the space. To complement the views, we used natural materials in our design and incorporated beautiful timber joinery and greenery while also sticking to a neutral colour palette to offer a calming, relaxed and happy environment for our people. Our non-allocated seating environment also promotes mobility throughout the day and we have a range of sit-to-stand workstations and standing height work surfaces. Are there any simple changes you would recommend to companies who aren’t in a position to move locations or transform their space? Absolutely. Perhaps the simplest, but also one of the most effective, is the art of spring cleaning. Removing objects or clutter that are no longer needed can work wonders for both the workplace and its people. The simple act of decluttering gives staff more headspace to think and create. Lowering desk dividers can also be beneficial. Breaking down the physical barriers in an open plan office, will in turn, break down communication barriers and encourage people to share information more openly, rather than turning to technology to email colleagues sitting several metres away. Lastly, I would say don’t jump on the bandwagon to change your office just for the sake of it. Revisit the reasons as to why you are looking for change in the first place. Is it to encourage collaboration? To better reflect your newly evolving brand? To allow for flexibility? It boils down to your business strategy, so wherever you are looking to go with your workplace design, always circle it back to the fundamentals of what you are trying to achieve as a business to keep your design on track.